"Due to your efforts and expertise, our educators continue to be America's leaders. " I cannot thank you enough for the site visit Friday morning! All four of these teachers have reignited their passion for teaching. Some of them were very honest in sharing they were the biggest cynics before visiting your school and now they are going to be our biggest champions for acquiring and integrating technology into our classrooms. One teacher said she would like to take back things she said in leadership meetings and at a PTA meeting and Maureen will very likely enroll her son in your school- I think that speaks volumes! Please share the good news with Annie too! You have done such a great job in your role at Emma K Doub- WCPS’s gain is FCPS’s loss! Good afternoon, I would like to express my sincere gratitude for your attendance and participation in the Grand Opening of the Lego Robotics exhibit yesterday at the Discovery Station. As the Interim Executive Director, having served on the Board for over 6 years, I have seen the positive impact our museum brings to visitors. The addition of the Lego Robotics exhibit will only enhance their experience. 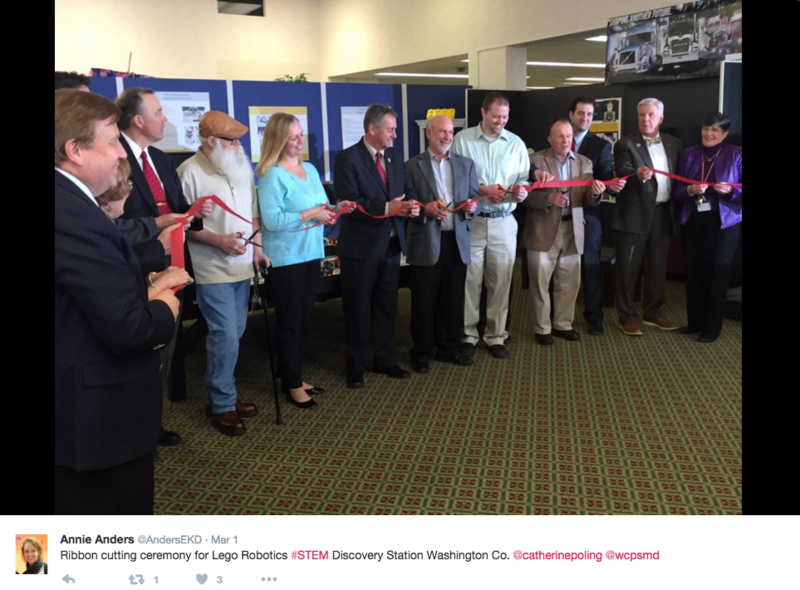 THE DISCOVERY STATION AT HAGERSTOWN, INC. The information you shared at the Maryland Advisory Council meeting on April 29th provided members with a comprehensive understanding of the various Professional Learning opportunities available around the State. Due to your efforts and expertise, our educators continue to be America's leaders. I just wanted to take a minute to say thanks for allowing us to come visit your school on Wednesday. We learned so much from our discussion and visiting your classrooms. The students were amazing in their engagement and the teachers have certainly set up routines to facilitate good instruction. I look forward to collaborating with you in the future. If you need anything from me, please don't hesitate to call. Take care and have a wonderful weekend. The next recipient is described as determined, perceptive, ambitious, logical, friendly, passionate, and professional. This person is passionate beyond words about meeting the needs of students and helping them learn in a 21st century classroom. She has been passionate about and involved with instructional technology since the late 1990’s, finding ways in every position she has held professionally and voluntarily to bring her vision to the forefront. Her most recent belief is that all children deserve high quality instruction and access to technology, thus implementing a 1:1 environment immersed with Promethean boards, mobile labs, green screen technology, digital photography, and video production. Professional development is of utmost importance when bringing this technology to the teachers and students. She understands curriculum is first and then technology tools and strategies are layered. The professional development she delivers is individualized to learners’ needs and she ensures that she isn’t teaching the tool, but embedding the tool into professional development. Data is used to measure the progress toward achieving goals. The recipient regularly blogs, creates and participates in online discussions, posts resources, creates bundles, Tweets, Pins, and communicates with staff and students while modeling the importance of authentically and purposefully using technology to achieve goals. Her professional vision carries over to the Maryland Society for Educational Technology in the various roles in which she has volunteered – Student & Teacher Contest Committee Chair, Secretary, and President Elect. Without further adieu, please help me congratulate Emma K Doub Elementary School’s Principal, Catherine Poling. I just wanted to tell you all that I had a wonderful experience at Common Ground. Pulling off a conference that size is no easy feat! The luncheon was very well-done and the puzzle box was an excellent addition!! The networking and opportunities to talk with other like-minded professionals was excellent! I very much enjoyed my experience as a conference attendee and as MASL President and wanted to be sure I thanked you all personally. "I was at my initial teacher interview with FCPS and my interviewer asked why I am passionate about teaching. I talked about how my fifth grade teacher inspired me to teach because she was engaging and showed us real world application. I explained how I wanted to make an impact on other children like you had impacted my life. At the end of my answer I said your name and my interviewer got a huge smile on her face. Not that I am surprised, but it turns out you are loved and admired by many! At the end of my interview, she gave me the best compliment I have ever received as a teacher. She said I was following in your footsteps. Anyway, I just thought I would say hi and let you know what a positive impact you have on so many people." I wanted to thank you and your staff for opening their classrooms to our group of Maugansville teachers. The “chatter” the past two days has been phenomenal in terms of their overall impressions. Naturally I opened Pandora’s box and they all want 1:1 now! Several mentioned how much they even learned about what they don’t know after interacting with your students. Student engagement and independence was a big ah-ha! Of course I reminded them that you all are several years out and the processes and culture is in place; even so, they were super impressed and it gave them a great sense of how learning can be transformed in new ways using the technology---just what I wanted them to witness! Minimally it gave them all a mental model for new learning environments and setting benchmarks for their future work. 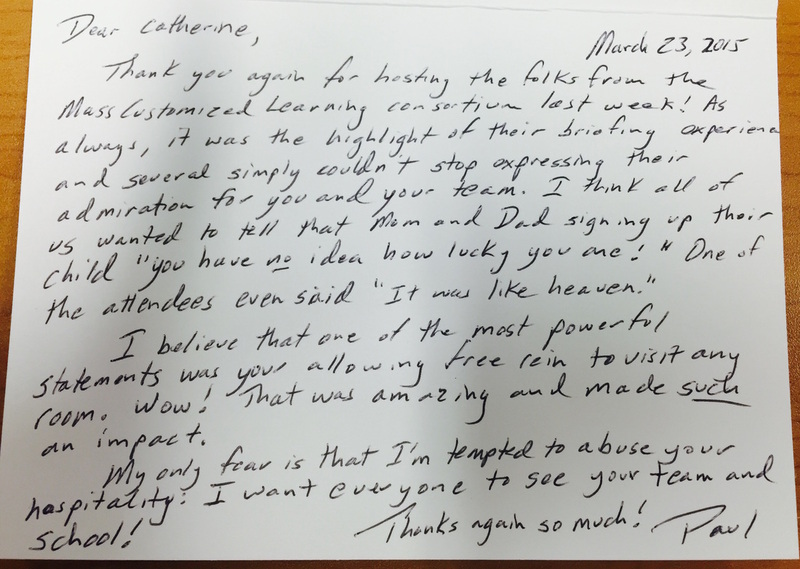 Thank you again for giving our folks the opportunity to see the possibilities! 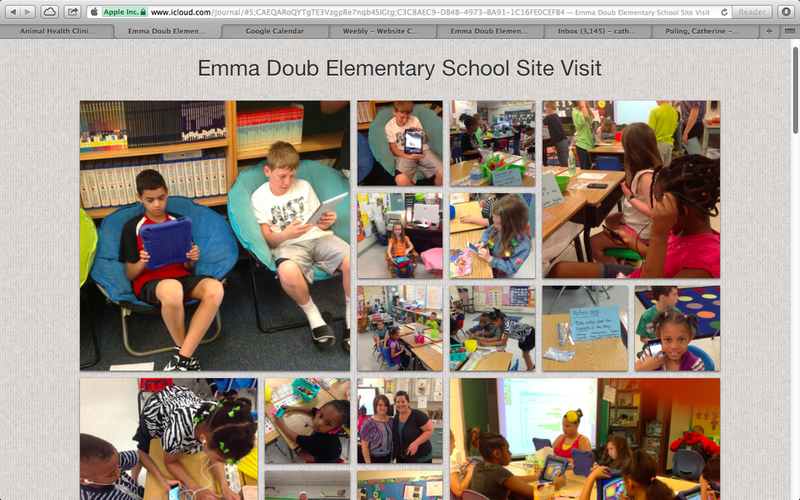 I want to thank you so much for letting me visit Emma Doub ES on Wednesday. I am amazed at what has been accomplished at every level with your staff and students with the 1:1 iPad initiative. You have done a tremendous job as a leader. I look forward to potentially showcasing your school to other districts if you are amenable. Please feel free to share the photo journal below with your teachers and students. I cannot express just how thankful we are for you allowing us to visit your school last week. I jokingly called the visit a field trip and in all truth, the experience was just as rich and rewarding as a field trip is for students . The entire visit was wonderful, beginning with the warm welcome you greeted us with when we arrived to your teachers being so accommodating and willing to give up their planning time to meet with us and answer our questions. Your school is absolutely lovely with a positive and warm atmosphere which I know comes form the top down. :))) We learned a lot from your teachers about teaching gifted students and feel that although the trip was originally about EGATE, we gained so much more. Let me add my thanks to each of you for an outstanding session. The large attendance was a tribute to the quality of the panel and wide-spread interest in the topic. Getting to meet Nancy and Catherine and hear the innovations they are implementing with students was very inspiring....On behalf of the ASBO professional development committee, please accept our sincere thanks and appreciation.